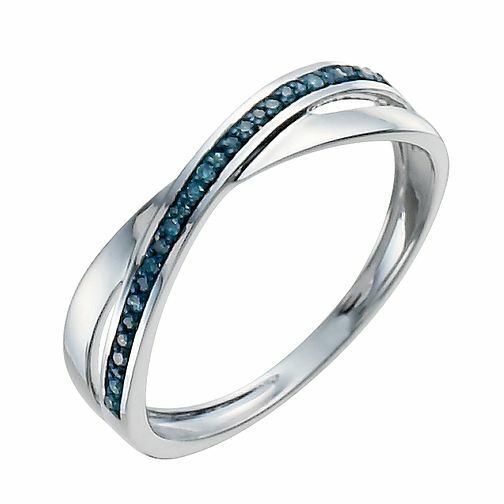 A simple 9ct white gold slim crossover ring, set with striking row of treated blue diamonds. A stunning twist on a classic diamond ring. 9ct white gold treated blue diamond crossover ring is rated 4.5 out of 5 by 6. Rated 4 out of 5 by Anonymous from Quality. Lovely piece of jewellery, discreet and subtle. Very happy with my purchase. Rated 3 out of 5 by Anonymous from Stunning dainty ring, although stone fell out within a week... This ring is beautiful if you like subtlety. Unfortunately a diamond fell out within a week. The customer service was as you would expect and a new ring has been ordered. I am told this rarely happens without a ring being damaged, which it hadn’t. Hopefully this is the case and the ring I bought for my friends birthday will last.